Looking for a versatile, safe, easy to use, reliable, efficient, and reasonably priced baby food maker? Us too! We put over a dozen baby food makers to the test and came away with some excellent options. The best baby food makers combine a steamer and food processor all-in-one, include food storage options, are BPA-free, and withstand the test of time and repeated use. Below we list the top 5 baby food makers for the year, followed by our in-depth reviews of about 10 different options. Baby food makers are an excellent addition to the baby essentials list for new parents. Available since the early 1990's in Europe, and in the U.S. for just over a decade, baby food makers have saved millions of parents' time and energy when making fresh, wholesome purees. And the systems have gotten much better over the years, with higher reliability, ease and convenience, more powerful motors, and phthalate-free plastics. Carrots? Peas? Sweet potato? Got it. Fun and healthy dessert blends like banana blueberry puree? No problem. Once you get your hands on a good baby food maker you'll be inventing recipes like a professional chef! And your baby will love you for feeding them so many delicious fruits and vegetables. By the way, our favorite baby puree recipe book is 201 Organic Baby Purees! There are tons of great, healthy recipes in there to keep your baby happy and exploring new food textures and flavors. Here are the Best Baby Food Makers of 2019! 1. BEABA Babycook 4in1 Pro Baby Food Maker. 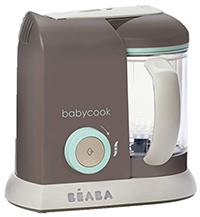 The top-rated BEABA Babycook 4in1 baby food maker is well known for reliability, ease of use, safety, and efficiency. They are the best baby food makers on the market, and for good reason. Even though it is a bit more expensive than other options, we think it is worth the extra cost. The BEABA looks and works great. It uses a large 4.7-cup capacity so you can fit several servings of food in one batch. You can use it with only 1 hand, so you can hold your baby in one arm while steaming, pureeing, defrosting, or reheating your food. The water reservoir on the side that holds water for steaming is stainless steel rather than plastic, and all surfaces that come in contact with food are BPA, lead, and phthalate free. We found that it is easy to clean, easy to use, and highly reliable. We were impressed with how quiet the motor was when pureeing with the baby food blender, and how evenly the steaming seemed to work. To steam, you place your freshly cut fruits or veggies into the basket and simply press the steam button. When it's finished, about 13-15 minutes later, you simply dump the basket of freshly steamed food into the bottom of the bowl and turn the knob to begin making nice smooth purees. We thought the button and knob were really intuitive and easy to use. And we used it to make baby puree and blend some frozen fruits and veggies as well, to make ourselves a little smoothie. Worked pretty decently as a little blender. Note that with any baby food maker that includes steaming, if you use anything other than distilled water, your water reservoir will develop mineral deposits; as suggested by Beaba, we found that descaling with vinegar every few months was really helpful. If you do have an issue it comes with a 1-year warranty and the customer service is great. We found this baby food maker for about $150. Interested? You can check out the Beaba Babycook here. Need to cook more than one recipe at a time? Check out the double Beaba Babycook 4in1 Pro for about $50 more. 2. 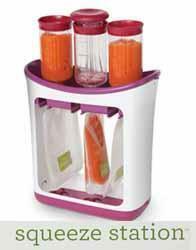 Babymoov Duo Meal Station Baby Food Maker. This is new for this year, and we got our hands on it in early January for some in-depth testing. It's a truly awesome and versatile top-rated baby food maker, with some serious functionality. The Babymoov Duo Meal Station is the only baby food maker on this list that can support simultaneous and separate steaming and blending, which allows you to start steaming another food (or keep steaming one tray of food) while blending another. We found this super helpful when steaming two foods that take different times to steam. For instance, we steamed a tray of green peas while steaming a tray of sweet potatoes: the peas took about 4 minutes, but the sweet potatoes took about 10 minutes (once the steam started). So, this system allowed us to start blending the peas while finishing steaming the sweet potatoes. That's great flexibility for a busy kitchen. It's also very high capacity, the largest on this list of best baby food makers, allowing us to prepare up to 9 cups of food at once! That's like 25 meals for a baby, so that's a big deal. If you don't need to make something that large, you can use just a single layer tray for one food type (or two that have the same cook times), or you can stack the trays up to separate two different types of food. It worked really well for smaller and larger jobs. The steamer was powerful and easy you use: add some water to the bottom until the light turns off, set the timer and you're ready to go. The baby food blender was powerful and the blade was sharp and durable, and the blender itself had three speed settings. 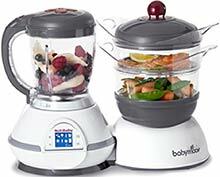 The two things that distinguish this from the Babymoov Nutribaby (below) are the ability to steam and blend simultaneously, and the three-speed blender. And the fancy LED screen and interface, which we thought was intuitive and easy to use. The steamer and blender parts are all BPA free (and lead and phthalate free) and dishwasher friendly, making clean-up a breeze. So why isn't it #1 on our list? It might be next year, but first, it needs to pass the test of time. Also, it's quite big, so people will smaller kitchens or otherwise restricted counter space might find it too large for their space. Coming in at about the same price as the Beaba Babycook, if you have the space, this is a must-have. Overall, this is an excellent baby food maker that we highly recommend! Interested? You can check out this Babymoov Duo here! 3. 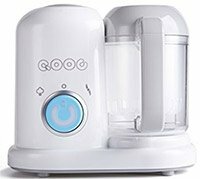 QOOC Mini Baby Food Maker. This baby food maker is brand new to the U.S. market, and is making some waves! It is a small-footprint and small-capacity unit, making it perfect for smaller kitchens, smaller batches of food, and less clutter on the countertop. Its size is matched by its simplicity. It is technically a 4-in1 baby food maker, which means that it does the usual steaming and blending, but it also can reheat and defrost, which is basically just the steaming function used for two other purposes. Convenient, but not any different from most others on this list. The capacity is relatively small, about 300 grams or 2 cups, making it the smallest of the bunch. Its look and feel, and functionality, are very similar to the Beaba Babycook, with a sleek and low-profile shape, and a large and easy to use button right up front and center. We found it very easy to use with only one hand: you simply turn the button to steam or blend and push the button to start. The lid, container, steamer basket, and blade are all dishwasher safe, and the blade pops out of the container for more thorough cleaning. All components that come into contact with food are also BPA free and do not contain lead or phthalates. Some other things we appreciated were the quiet motor, how easy it was to refill the water reservoir, and how little space it took up on our (already cramped) kitchen counter! Because this is a newcomer to the baby food maker category, we do not have extensive experience with it. In our limited testing for about a week, we found it quite capable and a great new competitor for this segment. It's small, but if that's what you're looking for, this is definitely a great option. Over the next 6-12 months we'll keep using this model and report back on its reliability; if things keep going like this, it's very likely to creep up higher on our list! Overall, a great option, and we found it for about $90. Interested? You can check out the QOOC Mini here. 4. 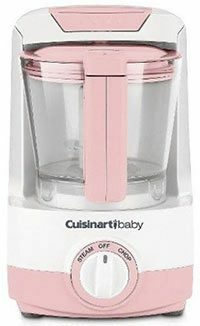 Cuisinart BFM-1000 Baby Food Maker. This fantastic Cuisinart BFM1000 baby food maker sells for about $50 less than the Beaba Babycook Pro. There are a lot of great features here, all in a sleek system that doesn't take up too much counter space. It does the steaming, chopping, and pureeing, but it also has an added bottle warmer feature on the back. Pop your bottle in for a couple minutes and it's a great temperature for your baby. Nice touch. In our tests we found the motor to be very powerful, the steamer very effective, and overall the unit was quiet and efficient. The blades were sharp and strong, and we thought it was super easy to clean. Unlike the Beaba, the transition from steam to puree is a bit easier given that there is no steaming basket to remove and empty into the bowl. But we do think the Beaba actually does a slightly better job with steaming the food, maybe because of the basket that keeps the food from resting against edges. Just like the Beaba, it is also BPA free on all surfaces that contact food. Cons? Well, the Cuisinart's baby food maker bowl is a bit smaller than the Beaba, coming in at 4 cups capacity. And we're not convinced that the bottle warmer feature is really necessary; maybe defrost and reheating features would be more convenient. In any event, this is an excellent baby food maker, and we highly suggest it. We found it for about $120. Interested? You can check out the Cuisinart Baby BFM1000 here. 5. 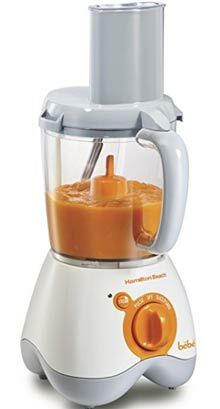 Hamilton Beach Bebe Baby Food Maker. Hamilton Beach is known for making good quality household small appliances for a reasonable price, including blenders, toasters, irons, and coffee makers. Anyone who has purchased a Hamilton Beach product probably realizes that they got pretty good bang for the buck, though there might be some small quality control issues with some products. This is the first year that we tested and reviewed a Hamilton Beach baby food maker, and we were pleasantly surprised! This particular baby food maker is surprisingly versatile given its price under about $60. It can steam veggies and fruits, chop them, slice them, shred them, and puree them until they are silky smooth. It starts with a steamer basket that holds about 3 cups of food. You fill up the bottom reservoir with up to 2/3rd cup of water, screw on the bowl, drop in the steamer basket with food, and then put on the lid. If you're steaming a full basket of food and using the full 2/3rd cup of water, it will take about 20-25 minutes to steam. With less water the steaming takes less time, there is no steam timer the system just shuts off after it steams all of its water. To puree, you pull out the steamer basket (it has a nice handle to keep your hand clear from the steam), attach the blade, and dump the contents of the steamer basket into the bowl. Put on the lid and you're good to go. In our testing, we found everything very logical to figure out and use, from opening the box to getting something steaming only took about 20 minutes. So, this is definitely one of the easier to use baby food makers on our list. Once you figure out how much water to use, the steaming function worked pretty well, and the puree blade was plenty sharp to get things pureed quickly. We only tried the chopping/shredding blade once (to chop some steamed carrots), and it worked just fine, as well as any of the other ones on this list. I personally prefer just chopping with a knife at that point to have more control over sizes. When we were done steaming and pureeing, we threw it all in the top shelf of our dishwasher. This made cleaning a breeze. We did have some challenges cleaning some areas of the system, especially the reservoir where water is kept (we cleaned it with vinegar and a straw brush), and the channel that directs the steam through the bowl was basically impossible to clean. So that got a little nasty after a couple weeks of use. If you have hard water you will probably have a bigger problem, with scaling in the water reservoir and deposits in the steam channel. Probably harmless, but worth mentioning. Another more serious downfall with this baby food machine is that the blade isn't well secured into place during puree mode. Though it never happened to us, parents have told us that the blade can pop up and spin against the bowl, causing it to scratch or badly damage the insides of the bowl. Another parent said that one of the metal puree blades completely broke off, which sounds pretty scary. Again, it never happened to us in our testing, but it's worth mentioning. Overall, this is a pretty good baby food maker that is offered at a very good price point. Interested? You check out the Hamilton Beach Bebe here. 6. Babymoov Nutribaby Food Maker. This unit does everything that the BEABA does for about $50 less expensive, but not quite as easily. With a dozen different parts that require two hands to assemble and use, it is a very involved product. It takes a bit of time to figure out, and it takes even more time since you have to manually dump steamed food into the food processor side. In our tests, we appreciated that it had two steam baskets that allowed us to steam fruits and veggies without mixing flavors. We liked the large capacity steaming area, holding over 6 cups of food, but thought that the baby food blender bowl could be a bit larger. It has a 2.5 cup capacity, which means that if you're steaming 3 cups of food in one layer of the steamer, you will need to mash the food down a bit into the blender to make it fit. We weren't really bothered by that, just wanted to point out that you can't steam a full 6 cups and blend it all at once. We also liked the little digital display that let us see the status. The other baby food makers involve a bit more guess work trying to figure out what is going on at any given time. Like the others, the parts contacting food are BPA free and dishwasher friendly. Overall, we thought this was a nice little unit once you get used to it. We also liked that it doesn't use the typical water reservoir which has been associated with scaling and some mildew/mold growth without proper cleaning. We found the steaming evenly done and the food processing quite powerful. While it had a lot of plusses, it's further down our list because it's a bit time consuming to learn, and there are a lot of parts to wash. We much prefer the one-handed operation of the BEABA and Cuisinart. Also, we found the baby food blender portion left a little to be desired, especially with smaller batches of food, which didn't blend very well: the larger the batch (up to 2.5 cups, which is still kind of small overall), the better it blended the food. But even with those small negatives this baby food maker does have some great things going for it, and we found it for about $100. 7. Baby Brezza Glass 4-cup Food Maker. Overall, this is a nice decent-capacity (4 cups, same as the Cuisinart, but smaller than the Beaba and Babymoov) unit that is easy and convenient to use and doesn't take up a ton of space on the counter. There are some really awesome features here! First, there is a one-button option for steaming and blending, which means you fill the water reservoir and put your food in the bowl, close it, and press the Steam + Blend button. About 10 minutes later and you're ready to go with freshly steamed and pureed fruits and veggies. Of course, if you only want to steam or blend, there are separate buttons to do those as well. Second, another great feature is that the water reservoir is removable, which makes filling and cleaning super easy. In our testing, we really appreciated this feature and thought it set a new precedent for other baby food makers to follow. Third, it has an easy to read and understand display that tells you how much time is remaining until you get to enjoy the food. Finally, when this model first came out on the market, we got a ton of emails requesting we review it, because it is the only all-in-one steamer and blender that uses a glass bowl. This means no more worrying about whether the plastic is BPA free and whether there are other harmful chemicals getting into your baby's food. The glass bowl takes care of that problem, and we think it is an excellent addition to the baby food maker category. Of course, that glass bowl and the blade are dishwasher safe. 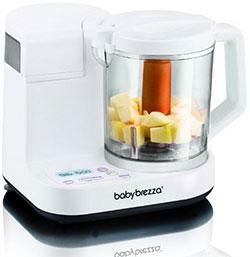 Overall, this is an excellent baby food maker option that you will certainly be happy with. Our only major concern with this model is that there are reports of poor reliability after a few months. We have happily used our test unit for over 6 months now without any issues, but we will be sure to update this review if we encounter any problems. Other moms report that they've had intermittent issues, such as water leaking from the base, the baby food blender not working, or the display showing erroneous information. Overall, this is a great baby food maker, and if it improves in reliability over time then it will likely crawl up on this list! It is usually available for under $150. Note that Baby Brezza also makes the famous Baby Brezza Formula Pro that can mix formula perfectly and put it right into your favorite baby bottles. 8. 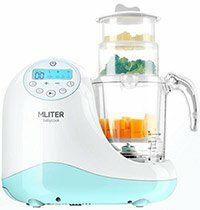 MLITER All-in-One Baby Food Maker and Steamer. Here at Mommyhood101, we're always excited about newcomers to the baby product market, and this MLITER baby food maker is an awesome example. We got our hands on this all-in-one steamer and food processor in mid-2018 and were really impressed by the quality, features, versatility, and relatively low price (about $90 at the time of testing). The MLITER can steam, sterilize, blend, chop, defrost, and reheat. Out of the box, the system is a little complicated to figure out, there are a lot of different plastic parts and we needed to read the manual a couple times and look online to figure out exactly how to use the system. Once we figured it out, we were impressed. The steaming is pretty flexible and you can put up to 3 levels of foods for steaming simultaneously - we put peas in the top, broccoli in the middle, and sweet potatoes in the bottom. The three stacking baskets are different capacities, the bottom one is largest (750mL), then the medium one (350mL), and the top one is smallest (150mL). When the baskets are stacked onto one another, the height of the tower is also great for fitting bottles for sterilizing or reheating/warming. So, this serves as a steamer, bottle sterilizer, and bottle warmer. If you want a separate bottle warmer, check out our reviews of the best baby bottle warmers. Once our sweet potatoes were steamed (about 15 minutes later), we tested out the blender to make a delicious puree - and it worked really well, the blade was super sharp and it pureed the potatoes in less than a minute or so. Clean-up was easy, and you can put the steaming baskets, mixing bowl, and lids right in the dishwasher. Some good safety features here too - it will turn off automatically if it detects a low water level in the reservoir, and it is free of BPA, lead, and phthalates, and uses FDA-approved food safety materials for all parts that come in contact with the food. There's a lot to love here, and we have been using it for a few weeks without any issues. But we aren't going to push it up on this list until this baby food maker proves itself over the longer term. We found it for about $90 online. 9. 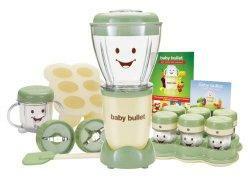 Magic Bullet Baby Bullet Baby Care System. The Baby Bullet was one of the first baby food blenders specifically targeting new parents, including a baby food cookbook, baby food storage containers (fridge and freezer), and a feeding cup. It also boasts the cute smiley face on the front to make you think there's something really special about this blender. On the one hand, it's nice to have a blender include so many parts that make storing and transporting baby food so easy. On the other hand, you can buy the storage containers and get a blender that's actually quite good for a similar price point. At first glance, this seems like a nice all-inclusive baby food making package. But it's missing something important: the steamer. Several customers have contacted us telling us that they bought this system not realizing that it doesn't steam the food. So, it's a glorified food processor with a smiley face on the side. And in our testing, we didn't find it to be a very powerful, quiet, or reliable blender. Looking around online, there are many parents who report various reliability issues including broken seals, cracking plastic, etc. We didn't encounter any of that in our short-term testing, but we do trust the input of the broader community of parents. So here it is, the baby bullet baby care system, down at the bottom of our list. If you're looking for a decent food processor/blender at an affordable price that includes a bunch of useful baby food storage and feeding options, then this could be a decent option for you. We found it for about $60. Another more reliable option, but without all the baby-related accessories, is the Cuisinart DLC2ABC Mini Prep Plus Food Processor, which is only about $35 and is super reliable, powerful, and perfect for processing steamed food to make baby purees. Many parents simply steam in a pot with a steamer basket (like this one), and then transfer that to a food processor. It's an extra thing to clean, but it can certainly save you quite a bit of money! Steaming and Processing in one: The original baby food makers were glorified food processors that changed their name and marketing, and were manufactured with some cute colors to entice new parents. With these old systems you had to cook fruits and vegetables separately in a steamer and then puree them in the processor. This method got the job done, but was a time-consuming process. More dirty dishes, more hands-on kitchen work, and more time away from your baby. 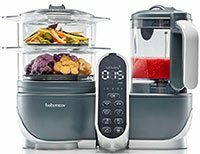 All the new systems we recommend are all-in-one steamers and processors, going way beyond what you will get with a classic blender or a modern mash maker or other baby food grinder. Put in the fruits and/or veggies, add some fresh water, and the system will steam it for you with the push of a button. Aren't around when the steamer finishes? No worries, just come back later to puree, which by the way is simply another push of the button. Two button presses later and you have a freshly steamed and smooth pureed masterpiece for your little munchkin. Some of the newer models even have a one-button feature, like the Baby Brezza: you press the Steam + Blend button and 10 minutes later your food is ready! Maybe a healthy veggie puree for dinner, maybe a fruity blend for dessert? You're the chef now, no more worrying about which Gerber options are on the shelf, or worrying about harmful additives! Four of the five products on our list include both steaming and food processing in one. Need to save time and have high quality pureed food without any hassle? Check out our organic baby food buying guide. Ease of Use: This is the factor that sets apart the good and bad baby food makers. The fewer steps the better, and the more logical the better. Some systems do this well and others get it wrong. If it takes a rocket scientist to help you figure it out and understand the owner's manual, it's a poorly designed product. All of our recommended systems are highly rated for ease of use. Reliability: Just like with ordinary food processors and steamer systems, there are reports of smoking motors, melting plastics, quickly dulled blades, breaking clips, and other various defects. Some of the systems have more issues with this, whereas other systems are consistently reliable and carry great warranties that are reliably honored. All of our recommended systems have histories of high reliability and customer satisfaction. Efficiency: If you're going to spend over $100 on a good baby food maker, you want one that will make smooth purees quickly and effectively. You don't want to run it, check whether your food is well blended, and keep trying. Weak and slow motors, dull blades, and poor blade design can all contribute to lower efficiency and more headaches. You want a fast steamer, powerful motor, and sharp blades. You also want a bowl large enough to fit enough food to make several servings. Avoid units with capacities under 3 cups because you'll find yourself spending a bit too much time washing, peeling, steaming, and smooth pureeing for single servings! All of our top recommended systems show high efficiency with both the steaming and processing stages. Safety: The original baby food makers used plastic steaming baskets and bowls containing BPA and phthalates, which many scientists and doctors believe leached into foods. These chemicals have been linked with a variety of health and developmental issues. Newer systems from major baby food makers have removed these harmful chemicals, resulting in safer food for your little baby. Even better, some use heavy duty glass bowls, like the Baby Brezza baby food maker, and stainless steel rather than plastic parts. The safer your baby gear, the safer your baby. Storage and portability: So, what do you do with all that great food you're steaming and pureeing? Definitely don't fill up those extra baby bottles, that will make a mess! Parents usually put the food into small freezer-safe containers (like these awesome ones by OXO) and take them out as needed. But there's also another way to do this that is gaining in popularity. You know those fun squeezable pouches of baby food? Like the popular ones by Happy Tot Organic, or Plum Organics? What if you could make those at home!? Well, the new Infantino Squeeze Station makes that possible. Simply steam and puree your food in one of our favorite food makers below, and then use the squeeze station to pour the puree into those awesome squeezable pouches. Not only is this an awesome and portable baby food maker option, but your toddler can take charge of the feeding and you're not stuck with a dirty spoon or dirty container in the end! Interested in this option, get more info by clicking the picture to the right.